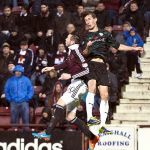 Raith Rovers went into this match away at league leaders, Hearts, with a run of 5 league games without a win, whereas Hearts remain undefeated in the league this season with ten wins and two draws. 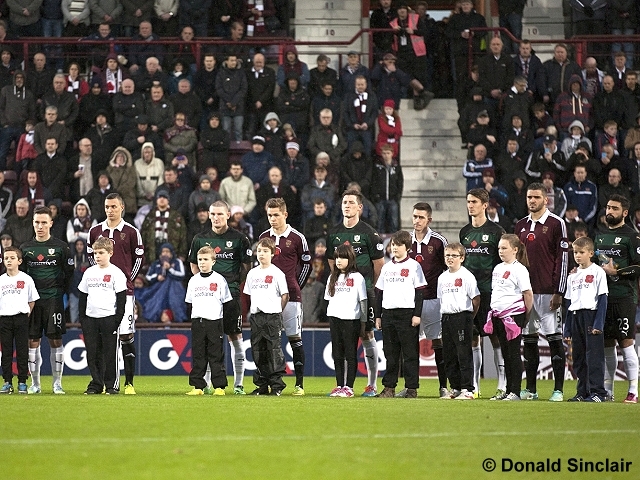 Before the match there were the significant events of remembrance weekend to be honoured, particularly with the close links of the two clubs through McCrae’s battalion. The lone piper played an emotionally charged ‘Flowers of the Forest’ followed by an impeccably observed minutes silence from the 16,000 plus crowd. Rovers showed two changes from last week’s cup win at Linlithgow Rose, with Kevin Moon and Barrie McKay both coming into the starting line up in place of Mark Stewart and Ryan Conroy, and Christian Nade fit enough to take his seat on the subs bench. Grant Murray lined the side up in a 4-4-1-1 formation with Calum Elliot up front and Jimmy Scott supporting him and the midfield. The game kicked off with the steady rainfall creating moist underfoot conditions on the pitch. 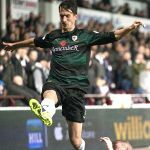 Hearts made their attacking intentions clear from the outset with former Rovers loanee Jamie Walker beating McKeown and striking his shot into the side netting in 2 minutes. Hearts were dominating the opening few minutes and Hearts fans were urging their number five, Alim Ozturk to shoot from whenever and wherever he had the ball. 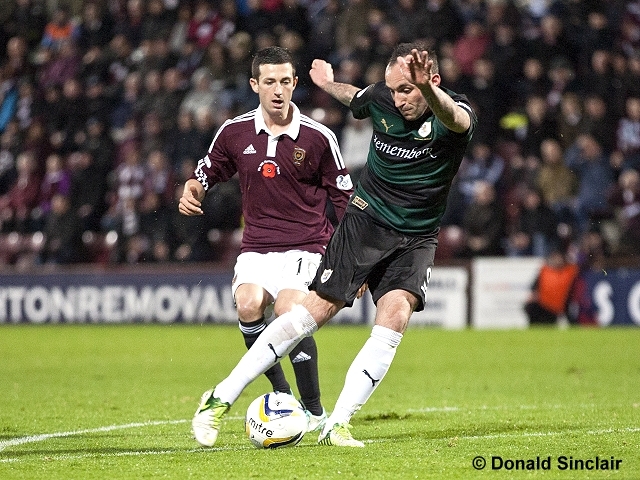 The memory of his stunning late equalizer against Hibs still fresh in their minds. However, in just 5 minutes he needed no encouragement, as Ozturk found himself in space 25 yards out and struck a rasper of a shot towards the Rovers goal. The swerve on the shot seemed to deceive Davie McGurn and he could only parry the shot into the back of the Rovers net. 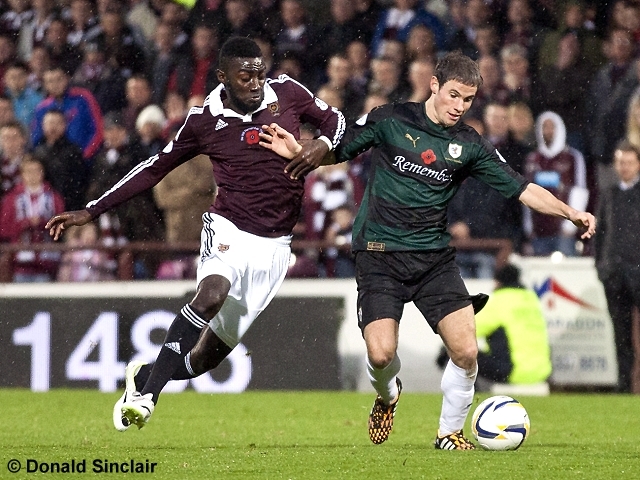 1-0 for Hearts after only 5 minutes was not the start that Rovers had hoped for. Hearts continued to press in the early stages looking to kill the game off early with half chances from Billy King and again from Ozturk but the Rovers defence held firm. 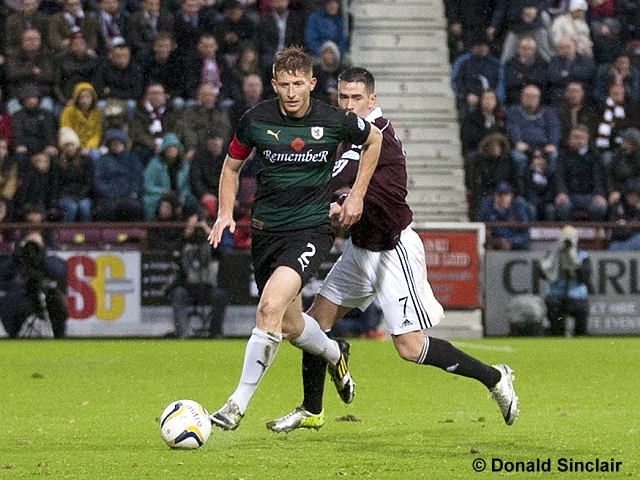 The possession in the first quarter was dominated by Hearts, but without creating any real clear cut opportunities. 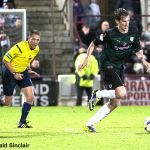 Raith finally started to get a foothold in the game in the 28th minute, after a short period of possession, Rovers were awarded a free kick which was taken by Jimmy Scott but blocked by the Hearts defence. Another Rovers free kick followed but was driven too deep by McKay. Then in 31 minutes, a McKeown throw in was flicked on by Anderson to Paul Watson, who’s looping header hit the roof of the net. 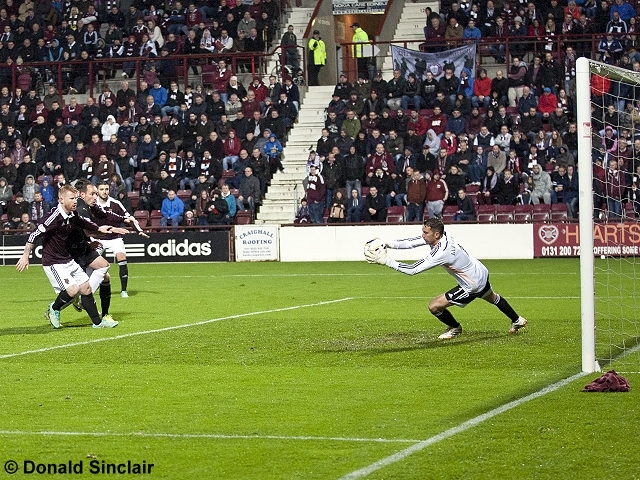 The same players combined again 4 minutes later from a McKay free kick, Anderson flicked the ball to Watson but his shot was gathered easily by Alexander in the Hearts goal. 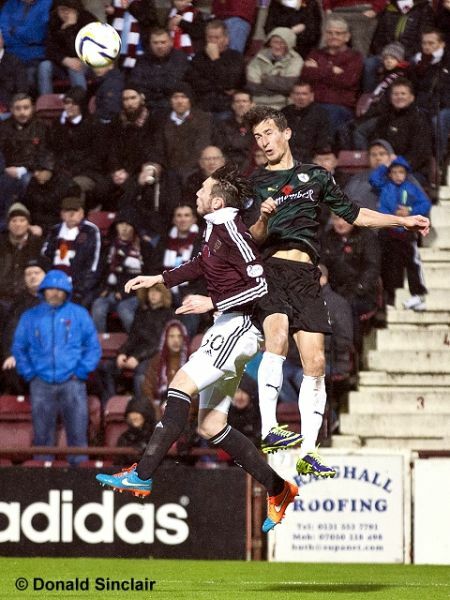 Hearts then came back into the game with Hearts number 9, El Hassnaoui’s shot saved by McGurn. 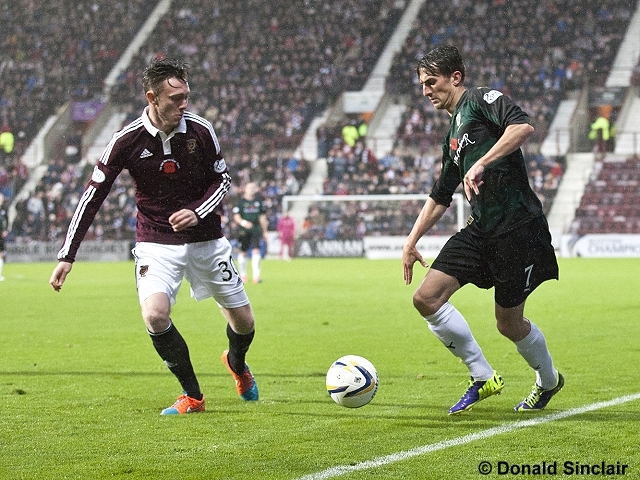 Nicholson then threaded the ball through to Jamie Walker, but McGurn was quick off his line to intercept. 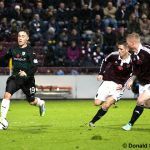 In the 41st minute, Rovers got a free kick 30 yards out from the Hearts goal, Elliot took it but his fierce shot was just over the bar. That was the last real action of a towsy first half. 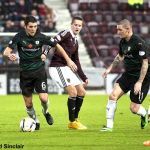 Hearts dominated the opening exchanges and possession but the Rovers defence kept their shape well and didn’t let Hearts settle into their usual attacking rhythm. 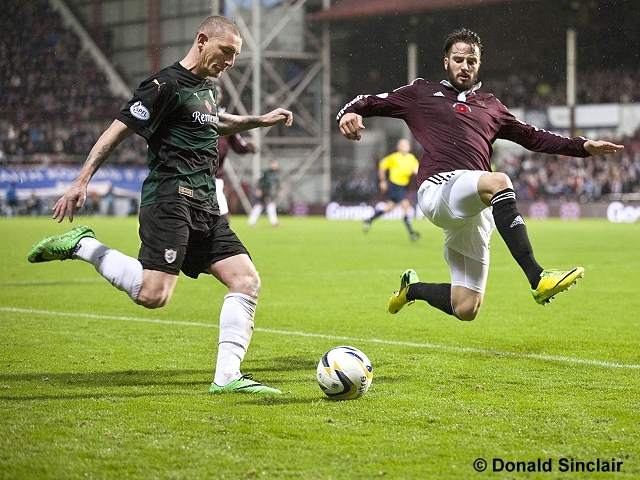 Half Time, Hearts 1 Raith Rovers 0. The second half started with no changes to the line ups. 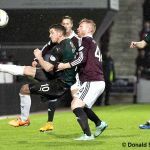 The game quickly settled into the same routine as the first half, with Hearts in possession and Rovers dogged in midfield and organized in defence. 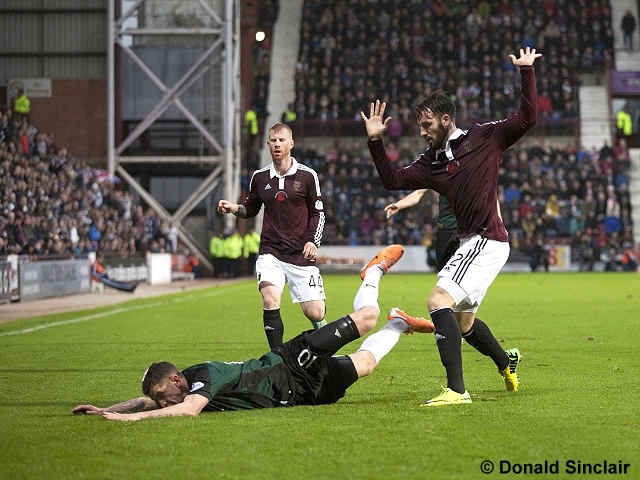 In 52 minutes, James Keatings, who scored a hat trick against Rovers at Stark’s Park came on as a sub for El Hassnaoui. He made an immediate impact sending a free kick just wide of McGurn’s right hand post. 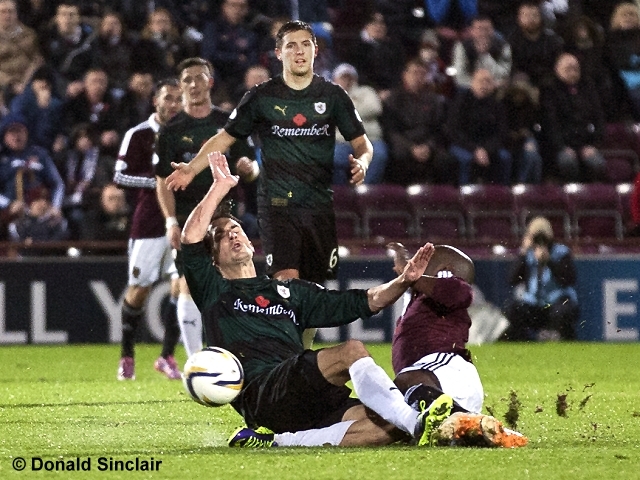 Three minutes later, Grant Anderson was injured in the Hearts penalty area. Things didn’t look good for him when the Rovers physio indicated that he’d have to be substituted. Mark Stewart got stripped and ready before Anderson made a miraculous recovery and re-took his place on the pitch. Hearts were continuing to dictate the play particularly through Gomis, and were clearly upping the tempo in an effort to get their second goal and kill off the game, but still they couldn’t create any clear cut chances. They sent another ex Rovers loanee Jason Holt on in place of Sam Nicholson. Rovers responded with their first substitution of the match, bringing on Mark Stewart in place of Barrie McKay in the 66th minute. 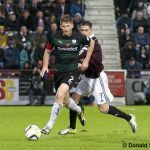 The game was now following a similar path to the first half with Hearts dominating the play in the first 25 minutes of the half before the resolute Rovers started to get a foothold into the game. 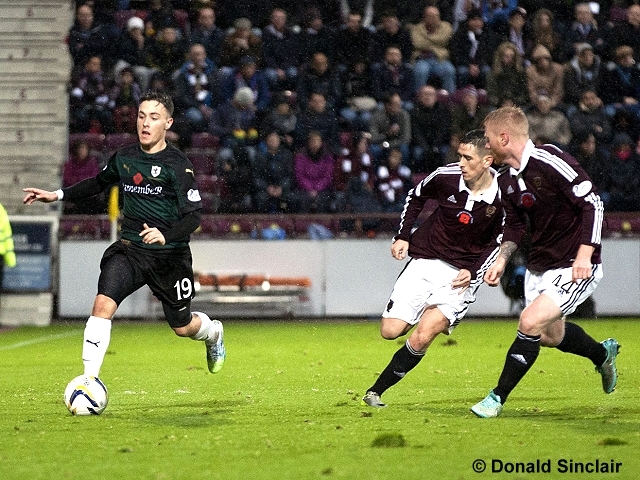 Liam Fox sent a teasing cross into the Hearts box but it was gathered by Alexander. 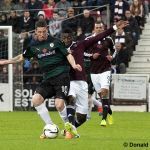 Jamie Walker then upped the pace and danced past several Rovers players before Thomson gathered the ball and cleared the danger. 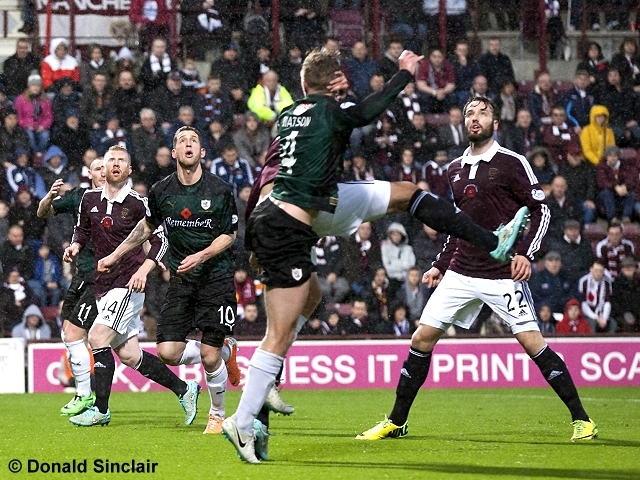 Hearts were on the attack again in the 73rd minute with Billy King firing in a strong shot but it was blocked by Watson. 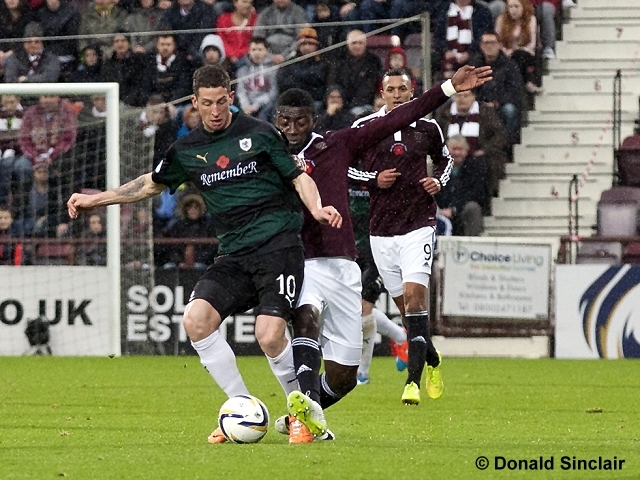 Raith responded with a glancing header from Elliot that was saved well by Alexander in the Jambo’s goal. 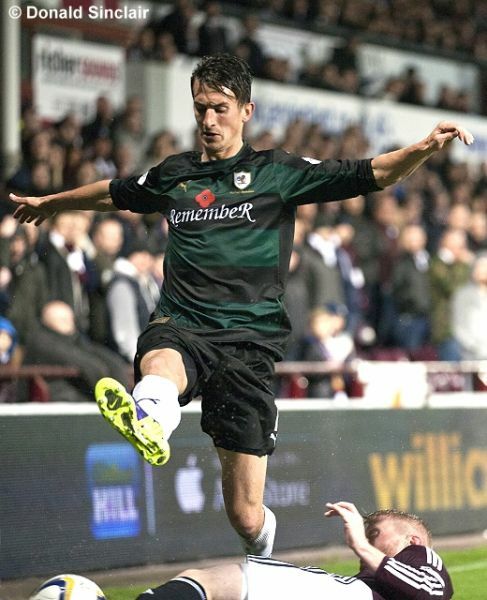 In 77 minutes, Hearts used their final substitution to bring on Buchanan for Jamie Walker, with Rovers replacing Moon with Conroy at the same time. Conroy had immediate impact whipping in a corner to the head of Perry, who put it wide. 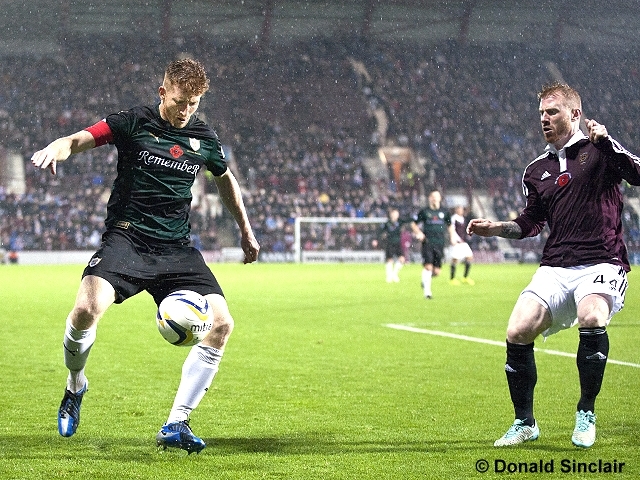 Rovers were still right in this game, and got an unexpected boost when Hearts were reduced to ten men, as Eckersley was clearly struggling with an injury and having used all 3 of their substitutions, Robbie Neilson took the decision to withdraw the injured number 44 and play out the game with ten men. 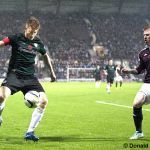 With three minutes remaining, Rovers were still trying to force a breakthrough, Thomson drove into the edge of the Hearts box, passed the ball to Stewart who fired in a great shot but was saved by Alexander – probably the best chance of the game. Rovers weren’t finished and when Alexander’s miscued clearance was picked up by Liam Fox 45 yards out, he tried an audacious shot that was saved by a diving Alexander to redeem himself. 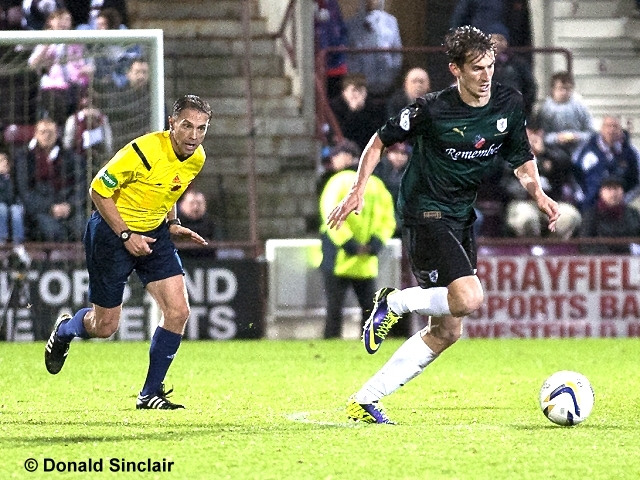 There was one last chance in the game and it fell to Raith, with Conroy shooting over from 20 yards. 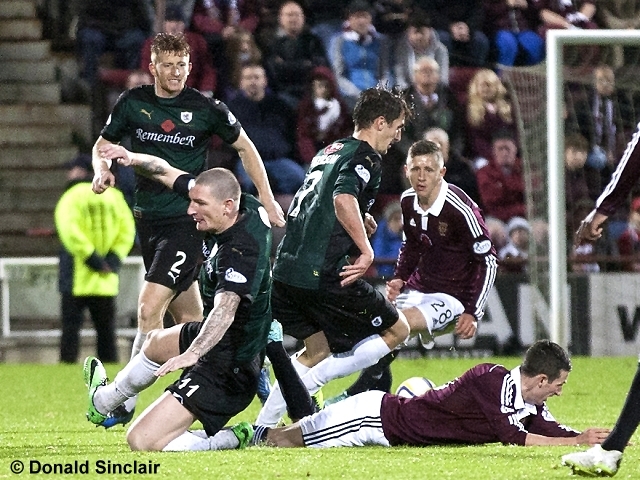 After 4 minutes of injury time, the referee blew for full time and it was Hearts who had held out to beat Rovers 1-0. This was a brave performance from Rovers, particularly given the strong start from the hosts going ahead so early in the game. Hearts had the majority of possession but by the end of the game Rovers had carved out more chances than the league leaders. The Rovers put in a disciplined display and with a bit more finesse in front of goal could just have sneaked a draw from this game. 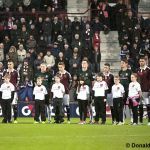 Hearts gave their men of the match awards to Ozturk, Gomis and Buaben, for Rovers there were solid displays from Thomson, Watson and Fox in particular. A solid, disciplined display from Rovers and a good base to build on ahead of next week’s fife derby against Cowdenbeath at Stark’s Park. 20 minutes to kick off and the stadium is filling up, the assembly is being entertained by a pipe band. They shall not grow old, as we that are left grow old: Age shall not weary them, nor the years condemn. At the going down of the sun and in the morning, We will remember them. Hearts kick off towards the rovers support. The rain is drizzling down, lets hope it doesn't ruin the match. Walker making a run down the right flank and into the box, shoots into the side net. Ozturk from 30 yards unleashes a rocket which Mcgurn could only parry into his own net. Goal Hearts. 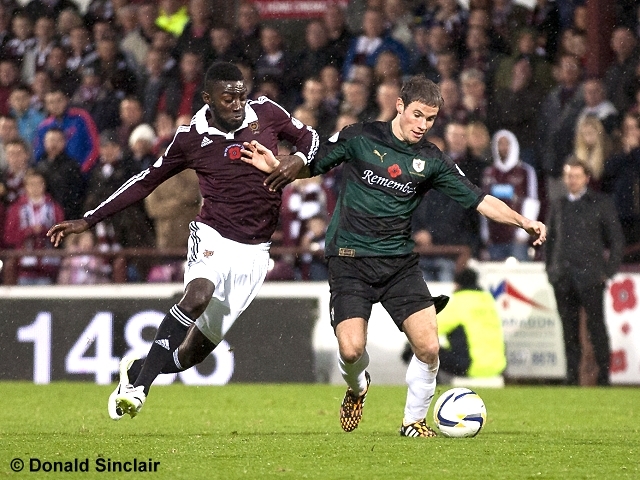 McKay races on a 20 yard run and contrives to give the ball away to Gomis. Rovers pressing, keeping the ball up the park. Perry temporarily out of action due to a foul. Watson down due to bang to the neck. Walker wins a free kick at the 35, Ozturk shoots round the wall and a yard past the left post. Fox receives advice from Mr Allan after a sliding challenge. McGurn scurries out of goal to impeed the advancing Buaben, the latter lets the ball go out of play for a bye. Perry making a robust but fair challenge on Buaben to clear just outside the area. Mr Allan having more word for a ruck on the far touch line. The rain is abating but the pitch is still very greasy. 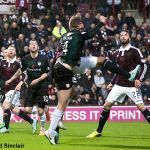 Hearts spend some time building an attack, stroking the ball across the park, Scott says 'énough of this' and boots the ball up the pitch. 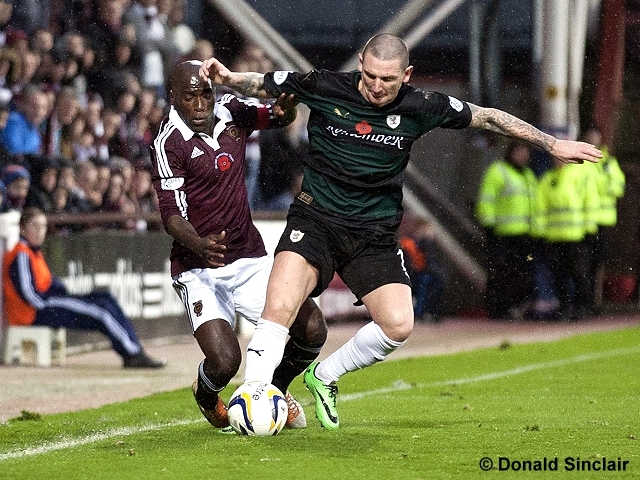 Scott has an effort blocked at the D, the ball is recycled and Raith have a throw. Anderson flicks the ball into the area where Watson was only able to glance his header onto the roof of the net. McKay's free kick found Anderson out wide, he flicks the ball into Wastson but his header is easily saved by Alexander. 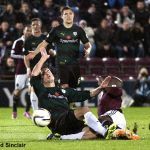 McKeown getting the better of Walker in a tussle at the corner flag. Scott nips into the area and provides for Moon who is denied by Alexander. Nicholson and Walker combine, the latter is denied by McGurn who slides out to save. Elliot sends his 30 yard free kick a yard over the bar. McKeown with a long throw into the box sees Scott flick his header over the bar. Rovers kick off the second half towards the away support. The ball is sticking slightly on the sodden pitch. El Hassnaoui comes of second best up against Fox. Wlker beats McKeown down the right but ends the move by sliding into the hoardings. El Hassnaoui off, Keatings on. Keatings, just on, floats a free kick from the right, over the assembled throng in the box and out for a bye. Anderson down in the Hearts box. Stewart getting ready to come on. Anderson makes a miraculous recovery to return to play. Anderson earning his corn by clearing a dangerous Hearts move. Rovers support showing their feelings after Anderson is denied a corner for his efforts. All sorts of errors by both sides, this due to the slippery pitch. Fox chips the ball goalwards but Alexander has it covered and clears. Walker causing all sorts of bother, we should never have let him go back. King hits a feirce ball goalwards, Watson takes a sore one blocking the effort. Gomis yellow for a foul on Anderson. Elliot flicks a header towards goal, Alexander has to stretch to parry wide. Walker off, Buchannan on. Moon off, Conroy on. Conroy swings in a corner, Perry on station but heads wide. Rovers keeping the ball in the Hearts half. Thomson looses the ball but back tracks quickly and clears. Hearts down to ten men, having used their three subs Adam Eckersly comes off injured. 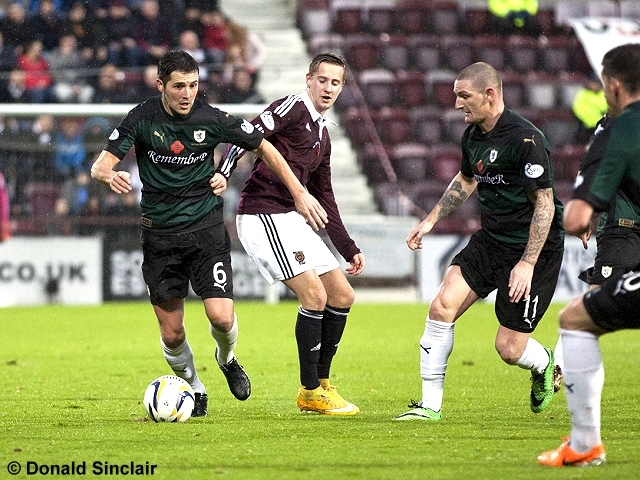 McGurn reacts quickly to clear, Perry with a slack pass back almost lets Keatings through. Thomson feeds Conroy who in turn shoots and forces Alexander to dive low to his right. Alexander comes out to clear, Fox has a pop from 35 yards and Alexander pulls off a save to ease his embarassment. +2 Conroy shoots over from 25 yards. 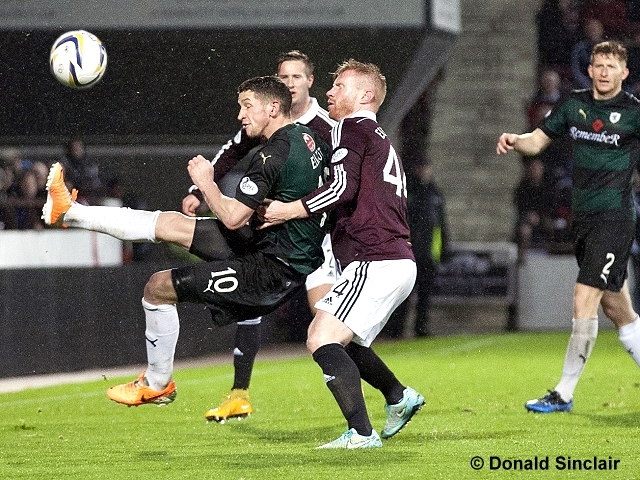 Full time, Hearts 1-0 Raith Rovers. Alexander, Ozturk, Gomis(C), Walker, El Hassnaoui, Nicholson, King, Buaben, McKay, McGhee, Eckersley. Subs, Gallacher(GK), McHattie, Holt, Pallardo, Keatings, Buchannan, McKirdy. McGurn(GK), Thomson(C), Perry, Watson, Fox, Anderson, Moon, Elliot, Scott, McKay, McKeown. Subs, Laidlaw(GK), Hill, Stewart, Callachan, Conroy, Vaughan, Nade.